In general, 10-K filings are much more consistent across companies and even industries than the more free-form 10-Q. There can be some quirks, however. For example, many companies leave the Legal Proceedings section blank and simply refer readers to different section, or even to an exhibit. Others give a short description under Legal Proceedings, and a fuller one under the Commitments and Contingencies footnote to the financial statements. And some companies put vast swaths of their 10-K into an attachment to the filing, labeled as Exhibit 13. So if important elements of the filing seem to be missing, check there. Seek and Find: For much of the information in its 10-K, IBM simply refers readers to excerpts from its annual report, filed as Exhibit 13. Once you have the right spot in the filing, it can still be tough to identify what’s really new. Sometimes companies bury a recent development in a dense paragraph and bookend it with long sentences describing years-old material. 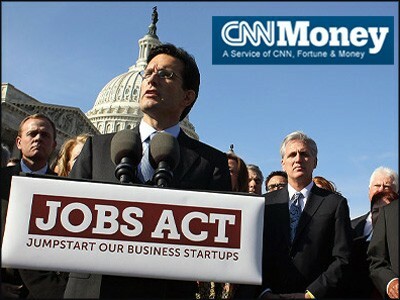 The JOBS, or Jumpstart Our Business Startups Act, allows small comapanies more access to fundraising. Now there’s a new reason you might come up empty when looking for information in a company’s filing: The Jumpstart Our Business Startups Act of 2012, aka the 2012 JOBS Act, lets “emerging growth companies” follow slightly different disclosure rules. In some cases, they can give investors fewer years of financial information than more seasoned companies must disclose. The law defines “emerging growth companies” generally as companies that have been public five years or less and report less than $1 billion in annual gross revenue. For more, see the SEC’s FAQ on emerging growth company filing requirements. If a company you’re interested in isn’t based in the U.S., but it trades on a U.S. exchange, it likely files a Form 20-F instead of a 10-K. Paid filings services tend to include 20-Fs in the same search category as 10-Ks (along with 10-K/A filings, which are amended 10-Ks). Using Edgar, however, you’ll need to search specifically for 20-Fs, or filter a company’s filing list using that code. Some 20-F filers use the same accounting standards as U.S.-based companies, called U.S. Generally Accepted Accounting Principles (U.S. GAAP), but many report their financial statements under International Financial Reporting Standards (IFRS). Moreover, 20-Fs aren’t required to include all the information typically found in a 10-K. For more details, see page 10 of this FAQ about foreign private issuers from the Morrison & Foerster law firm. Periodically, you’ll see a company file dozens of exhibits at once with a 10-K, and most prove to be several years old. Sorting through them for anything new is a pain. You can thank an obscure rule, dating from the days of paper documents, that requires companies to re-file certain exhibits every so often. Be sure to check the dates in exhibits to see if they notes when they were executed or last amended. When companies talk about the financial impact of new developments, they’re often quick to describe anything unusual as a “special” item – which is shorthand for saying investors should ignore it. These are “non-GAAP” measures – figures that don’t conform to U.S. Generally Accepted Accounting Principles – and typically have to be disclosed as such. Investment analysts often happily comply use these quirky measures, saying their job is to understand a company’s underlying value, outside the vagaries of any given quarter or year. But watch out: Once companies start leaving out various costs (and, more rarely, gains), it quickly becomes difficult to compare one company to another, or to evaluate a company’s results over time. If you do decide to report these non-GAAP figures to your audience, be sure to include standard measures like revenue and net income somewhere in your piece as well.